First of all, stretch your canvas a bit by pulling the borders of your picture away. You've done this quest, when you see the grey border around your working area. Now select white as your foreground-color and use it to fill the whole image. 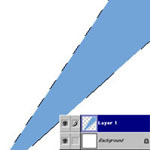 Then select two colors, foreground brighter than the background-color (i chose two types of blue). 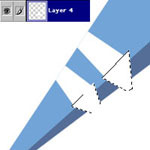 Select the polygonal lasso-tool (either just click it or -feeling professional- hit Shift+L until it's selected) and make a selection as shown in the picture to the left. Be sure that your selection "overlaps" your working area into the grey area around or you may experience problems later. 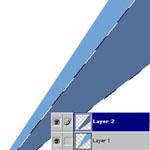 Create a new layer (Ctrl+Shift+N) and fill your selection with your foreground-color by either using the Paint Bucket or by pressing Alt+Backspace. Use Select -> Transform Selection and spin it just a little bit clockwise, then press return. Move the selection down and to the right some pixel until it looks fine for you. You don't know how to tell it's fine? Well, it could look just like the one to the left. If you think you got a better position for your selection, keep it. When done this, fill the selection with your background-color. X, Alt+Backspace does the trick. Now have a closer look at your Layerwindow. If you can't find it, go to Window -> Show Layers. Move the layer with the darker shape in it down a position (right below the brighter shape) and create a new layer on top-position. You may notice that the darker shape is partly covered by the lighter shape, what's fine, because it will be the 3D-look at the end. 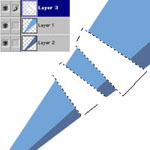 Use the polygonal lasso tool on the new layer to create some selections again, do it roughly like shown in the pic to the right. Ha! Gotcha! It's on the left, of course. Fill the selection with white afterwards. Ctrl-Click on the little picture left or your brightshaped Layer to load it's selection. Then hit Ctrl+Shift+I once to invert it. If not still highlighted, click the layer with the white shapes. Then press delete and realize, how the white thingies are merciless shaped to fit one side of the Bar below. 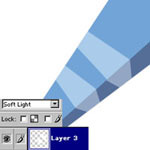 On a new Layer create some white shapes again, this time make sure that they hit the other shapes perfect at the Edge between the dark and the bright layer. Have a look at the picture to the left and zoom in (Ctrl++) if needed. Load the selection of your dark shape (Ctrl-Click its Layerimage) and substract the selection of the bright one (Alt+Ctrl-Click this time). By now, you should only have a selection around the visible part of your dark shape. Click on the second whiteshape-layer, invert the selection and watch the miracle happen: they fit perfect. At this time, you may want to merge the white shapes together by slecting the upper one and press Ctrl+E. Do the same with the blue shapes. Then apply the blendmode "Soft Light" to the layer with the white shapes on it to achieve some nice effect. Try other Blendmodes and colors for other results or just be happy with this one, we're..